Categories: Architectural, Chemical, Construction, Food & Dairy, Food Processing, Medical, Oil & Gas, Rect Tube, Stainless Steel, Transportation. 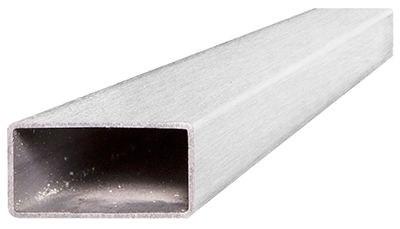 The 316L stainless steel rectangular tube is a popular product. It is a non-magnetic metal that has been alloyed with chromium, nickel and molybdenum. Because of this fusion, the final product is resistant to all sorts of corrosion caused by heat, warm salt water and chlorides. This is a widely used grade of steel, which is commonly used for applications like food prep equipment, pulp machinery, heat exchangers, boat fittings, valves and condensers. Industries this metal is widely found in include paper, chemical, pharmaceutical, food, beverage, marine and automotive, among others. What also makes this a versatile product is its readiness to be welded, machined, formed, drawn, annealed and cold worked. The versatility of this grade of steel eliminates limitations that other metals may have. For instance, all standard fusion methods of welding can be used for this product. This can also be done using filler metals. No post-weld annealing is required for the 316L grade of metal (unlike with the 316 alloy). Annealing should be done after forging this metal. Forging should be completed at a temperature no higher than 2300 degrees F and no lower than 2100 degrees F. Annealing should be done at a temperature between 1900 and 2100 degrees F. Keep in mind that this product can’t be hardened using heat treatment. 316L stainless steel is very tough and ductile, which enables it to be easily cold formed using cold heading, bending, swaging, roll forming and deep drawing. Annealing should also be performed after this is completed, so to remove stresses that have been caused by severe cold forming. The machinability of this product is lower than 304 alloys because 316L steels are much tougher.